The popularity of tango has exploded all over the world. Sensuous and sophisticated, the tango is a feeling that you dance. Five-time Grammy Award-winner Gilberto Santa Rosa will appear as a special guest vocalist for the first three weeks of the engagement. 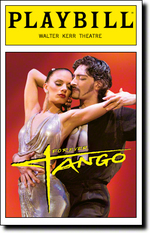 Forever Tango features a cast that traces the colorful history of the tango through music, dance, song and dramatic vignettes. The dance couples are accompanied by an on-stage orchestra that includes musicians who play the bandoneon, a small accordion-like instrument with a melancholy sound unique to the tango.